Researchers believe this is because sociable children go on to develop good social networks in adulthood, giving them close family and friends who they can call on for emotional support. The King’s College London study analysed data on almost 5,000 people born in England, Wales and Scotland in 1958 who are being followed by the National Child Development Study. The researchers examined information on children’s and adolescents’ social activities outside of school at ages 7, 11 and 16, and their levels of anxiety and depression at ages 42, 45 and 50. The researchers then explored factors that may have caused stress or fostered resilience. They considered whether participants, at age 45, had experienced any upsetting life events in the past six months, such as losing a job or splitting up from a partner. They also looked at people’s ‘social resources’ at age 45, as measured by the amount of emotional support received from close family members, number of social ties, frequency of contact with family, friends and acquaintances outside the home, and participation in social groups. Social resources were then divided into three categories – rich, typical and poor – ranging from the most to the least. Among adults who had experienced one or two recent stressful events, those who had rich and typical social resources had fewer depressive symptoms at age 45, and later at age 50, compared to those who had poor levels. For those who had faced three or more stressful events, only adults with rich social resources had lower levels of mental ill-health at both ages, compared to those who had typical or poor social networks. After accounting for gender, social background and prior mental health problems, the benefits of having rich or typical social resources were reduced, but still remained, compared to those who had poor social networks. After taking into account people’s social habits and networks in childhood and adolescence, the link between social resources and emotional resilience in middle age disappeared. The researchers explained this was most likely because sociable children tended to become outgoing adults, developing the social support and networks to help them overcome stressful events in middle age. Most adults received emotional support from those individuals closest to them, including their spouse (80%), parent (4%), children (4%) or sibling (3%). At age 45, nearly half of adults hadn’t experienced any stressful events over the past six months, compared to 41 per cent who had experienced one, and 13 per cent who had faced three or more. The study’s authors said: “Our findings show that individuals who have regular contact with a larger network of social ties and more supportive relationships reap the benefits, not only at the time of exposure to stress, but also over the longer term. 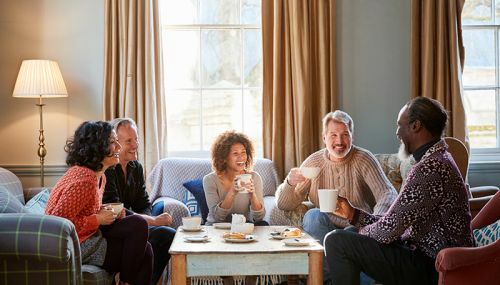 “Supportive relationships may positively influence individuals’ response to stress by promoting use of healthy behaviours and discouraging risky behaviours; they may also bolster individuals’ beliefs that they are able to cope effectively with stress, and instil a sense of responsibility towards their social ties, for example, by needing to stay healthy to provide for a family. “We show that more sociable children and adolescents have more and better-quality social resources by mid-life, adding further evidence to the growing body of studies showing that precursors of adult social resources are rooted in early life. ‘No man is an island: social resources, stress and mental health at mid-life,’ by Rukmen Sehmi, Barbara Maughan, Timothy Matthews and Louise Arseneault, was published in The British Journal of Psychiatry in March 2019.